Can you see the smoke coming off these babies? 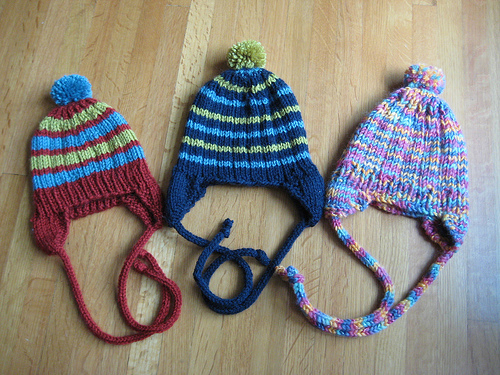 I made all three of them in four days. The last pom pom was attached with about 20 minutes to spare. But now they are in the hands- or on the heads- of Gwen’s three classmates as they begin the winter holidays. This entry was posted on December 18, 2008 at 9:28 pm and is filed under Uncategorized. You can follow any responses to this entry through the RSS 2.0 feed. You can leave a response, or trackback from your own site. I love anything knit! I wish I was in Gwen’s class! These are spectacular! i recognize that one on the right. perhaps we have borg to thank for the quick progress! they all look great! Holy crap you knit fast. And they are all lovely too. I love them. What pattern did you use?